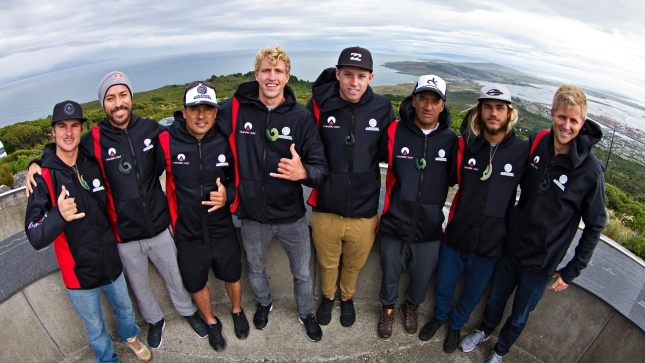 Zane Schweitzer has gone back-to-back at The Ultimate Waterman in New Zealand, defending the title he first won 12 months ago after a tight, week-long battle Australia’s Jackson Maynard and Brazil’s Caio Vaz across the eight surfing, racing and strength disciplines that make up this unique event. 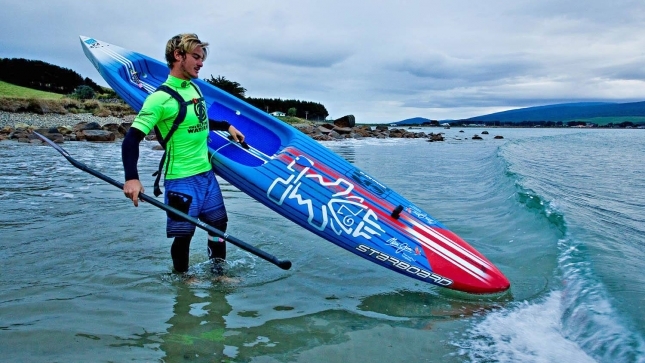 World number one Connor Baxter was fourth overall after taking out the SUP racing discipline for the third year in a row. Zane finished the week with a 4th place in the ‘Waka Ama’ OC-1 race (one-man outrigger canoe) this afternoon, which kept him ahead of Maynard despite the Aussie saluting today. Maynard book-ended his Ultimate Waterman debut with victories, taking out today’s race after claiming his signature event, the prone paddleboard race, on the opening day last week. Connor was runner-up in today’s outrigger race. When I spoke to him about his victory last year, Zane said winning The Ultimate Waterman was one of his proudest achievements, and no doubt he’ll be flying high after successfully defending his title against one of Australia’s best all-round ocean athletes. The Starboard Dream Team rider certainly did it the hard way this year, taking a couple of losses in events he was hoping to pull ahead in – including his ‘double whammy’ longboard contest – and having to make up ground in events he struggled with last year such as the underwater strength contest. Competitors could nominate one specialty discipline where they’d earn double points, however the wins were spread right around this year with only Maynard and Connor winning their select events and only Manoa and Maynard winning more than one discipline. Points from all 8 disciplines were combined into an overall leaderboard — see the final standings down below. While it looked like it would come down to the wire, the turning point of this year’s Ultimate Waterman came when Zane finished runner-up to Manoa Drollet in the penultimate event, the underwater strength & swimming contest. After finishing 7th in the corresponding discipline last year (there are only 8 competitors in The Ultimate Waterman), Zane dug deep to out-pace both Caio and lifeguard champion Maynard in the pool to all but seal the overall title. 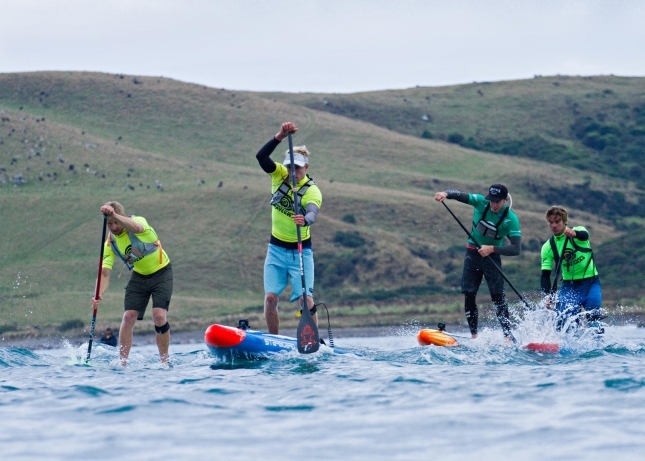 Another key moment came in the 16km SUP race, where Maynard was on track to upset Zane and steal some valuable points heading into the final two contests. But after taking an inside line along the coast and losing ground, Zane started connecting the bumps in the final few kilometres to reel in the Aussie and keep his points buffer secure. Huge credit has to go to Jackson Maynard for showing just how strong Australia’s ocean athletes are. This guy rarely paddles standing up but was able to mix it with a couple of the world’s best, along with dominant performances in the prone and OC-1 races plus some impressive efforts in the surf contests. Maynard competes on Australia’s ultra elite Ironman Series (‘surf life saving’ aka lifeguard racing), while he hails from the paddling mecca of Currumbin on Queensland’s Gold Coast, which is home to half a dozen of the world’s top-ranked SUP racers. Caio Vaz was also particularly impressive, showing that he’s far more than “just a surfer” after a string of top three finishes. After featuring the likes of SUP superstars Kai Lenny, Georges Cronsteadt and Danny Ching in the past, the event had another strong stand up paddling field once again this year. In addition to well-known stand up athletes Connor, Zane and Caio, Chuck Glynn was also in the mix and finished the week strong with a third-place in the OC-1 race. But the week belonged to Zane Schweitzer, so congratulations to the energetic Hawaiian on a massive performance. Full results are below, and you can follow the event on Facebook for more updates. If you want to see more: The Ultimate Waterman is also airing on Red Bull TV right now.